Quotes | Borderline between what and what? 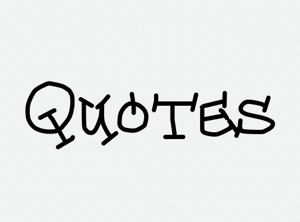 I am a quote whore-der. I love them…I can find one to give someone no matter the situation or topic…and sometimes, quotes articulate a thought, feeling or message better than I can with my own words. Words are powerful things…that sticks and stones ditty is a load of crap because words can hurt you. I was too lazy to go through my quote collection and put the following quotes in my post from the other day (God, love, honesty and cussing.) and I was going to go back and edit that post and add these as they are related to that post…but I decided to put them in their own post instead.